Richard has 43 years of experience working in fire departments, including retiring as the fire chief of Cincinnati, Ohio, where he was responsible for a $110 million budget and 850 firefighters. 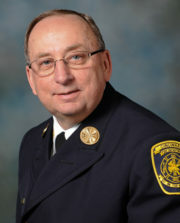 In addition to directing all operations of the fire department, Richard’s experience includes communications center and computer aided dispatch development, contract negotiations, policy arbitration, grant writing, strategic planning, process improvement, safety awareness and training. He received the 2007 Columbus Fire Chief’s Award. Richard has a bachelor of science degree in business administration and several certifications from the State of Ohio, National Fire Academy, Federal Emergency Management Agency and National Incident Management System. He is president of the Ohio Metro Chief’s Association, president of the Cincinnati Fire Museum, and a member of the International Fire Chiefs Association.